The State Library as a Hybrid Space? Aarhus is a considerably small city, as one notices often, and especially in this case, when searching for an example of hybrid space. 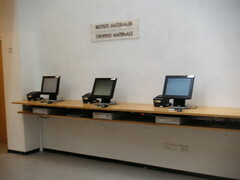 Entering the State Library on the University Campus, you become aware of how pervasive computer-technology has become. 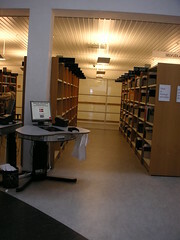 Even though you want to get hold of an analogue, old-fashioned book, you have to use digital devices: You have to take a look at the computer screen to find its place in the reservation shelves and then you have to check it out, using your health security card. These two interfaces define not only how you perceive the library space but also your interaction with other people (s. de Souza de Silva, 261). You don’t need to interact with other people, namely librarians, to get your books, you can do it on your own, advised by machines. To put it boldly, those machines treat you not very different from objects like books: You might not have a barcode and not be pushed over a sensor, but you are identified via your CPR-number and your health-insurance card. The system might work smoothly and be practical but it also creates, as usually in augmented space, a monitored space (s. Manovich, 223). through which you can enter the virtual space of the Internet and as well send data to the printers, which again, identify you as a CPR-number. But you might not need the computers to enter the Internet, because you brought along your own laptop and can enter the w-LAN on the campus, as well as use your mobile phone to connect to the University network (or to phone someone, of course, and also create a hybrid space), which means you can also search for books or surf on the Internet from the cafeteria downstairs or from the toilet, if you wish to, because thanks to your portable device, you can always be connected to digital spaces (s. de Souza de Silva, 263). Maybe these mobile devices bring actions from private places to public spaces, as de Souza de Silva argues (s. 272) – you might use the w-LAN in the cafeteria or somewhere else as said before. Or you might bring it along to prepare a presentation with other students sitting at the work places provided by the library. 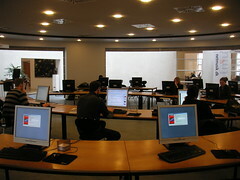 But as the w-LAN on the campus does not have specific features you could not use from home (or the computers in the library), you might move such “social” activities as preparing presentations from the library to your home, if you are a well-adapted computer-user: Every one of the participants of your presentation could sit at home at his or her own desk (no need to carry heavy books all the way to a meeting point), you could have a Skype conference, send around links and files, get further information from the internet,… and basically have a cozy afternoon at home without people hurrying around or background noise from the cafeteria.